Army experts were called to the Brownstown last night. 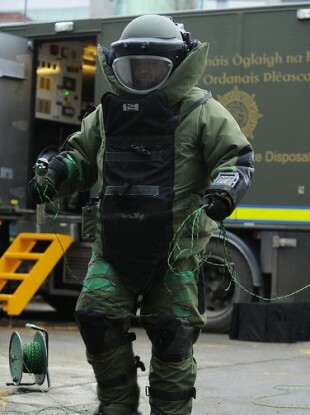 A NUMBER OF homes were evacuated last night after a homemade bomb was found outside a house in Co Kildare. Army explosive experts were called to the scene in Brownstown at about 10.50 pm after a suspect device was found. A cordon and road closures were put in place and a number of nearby houses were evacuated. The Defence Forces say the Explosive Ordnance Disposal Team made the device safe without the need for a controlled explosion. It was later determined that the device was viable with all items then handed over to gardaí. The scene was declared safe at 12.10 am. Email “Houses evacuated after homemade bomb found outside Kildare house”. Feedback on “Houses evacuated after homemade bomb found outside Kildare house”.